Over the last 5 years, the desirability of aluminium bi-fold doors has rapidly increased across the UK. This surge in popularity can be attributed to a mixture of Britain’s increasing temperatures, heightened awareness of the impact of curb appeal and contemporary ease of use, as well as the more obvious ‘wow-factor’ that these fashionable concertina-style doors conjure up with ease time and time again. At Budget Windows, we offer the finest quality aluminium bi-folds via the beautiful Origin collection. Let’s explain why we believe these aluminium bi-folding doors are the best bi-fold systems around. Surpassing current security standards, Origin bi-fold doors can include unique anti-snap, anti-pick, anti-drill & anti-bumping 8-point locking systems; dependant on the required configuration. As well as ultra-secure hinges, chamfered 20mm linear bolts are utilized within the design too; effectively repelling the most determined of intruders from entering homes right across St Albans and Hertfordshire. 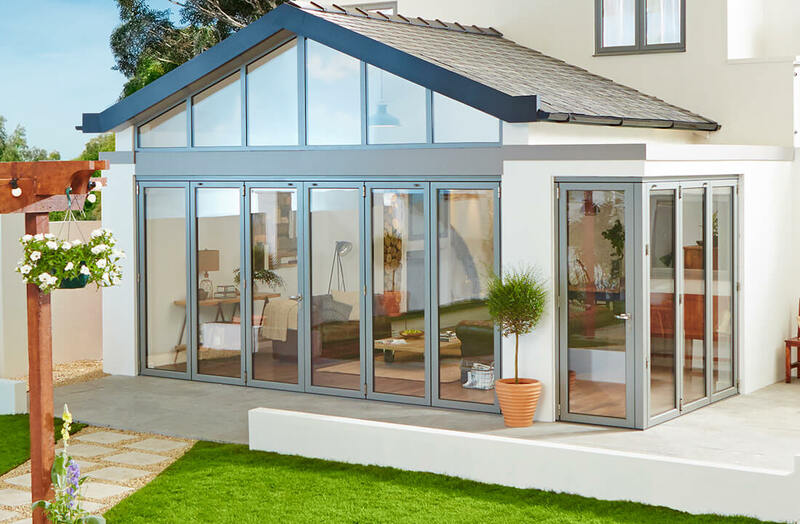 Origin’s aluminium profiles are exceptionally durable & lightweight, providing homeowners with complete peace of mind that their new bi-fold is a sound investment that’s built to last. With a choice of one to eight door sets and up to 12 door leaves, falling anywhere between 400mm and 1200mm wide, there really is a bi-fold configuration to match a multitude of specific installation requirements. Containing the power to insulate homes all year round, Origin’s superior bi-folds are designed with the UK’s fluctuating climate firmly in mind. Able to achieve a U-value as low as 1.3, with the correctly specified glass, this means the Origin bifold exceeds the required thermal performance for building regulations. Expertly containing and conserving heat and sound with some of the firmest, weathertight seals around, homeowners who take advantage of impeccable Origin bi-folds can fully enjoy a quieter, cosier home whilst saving ample sums on their energy bills too. Made to measure, Origin bi-fold doors are fully customisable; allowing for a bi-fold system that’s as individual as you are! Origin’s beautiful bi-fold range is available in over 150 different RAL shades and woodgrain finishes (matt, satin or gloss), as well as a proactive dual colour option; allowing homeowners to complement both interior and exterior colour schemes. With the Origin bi-fold range you can even colour co-ordinate your door seals, with 7 colours to choose from! If you’re planning on enhancing your home with a luxurious aluminium bi-fold door installation or wish to upgrade your existing bi-folds, contact the Budget Windows team on 01727 832 333 or send us a message online.